A coagulant is anything that curdles milk. Rennet is a generally used as a generic term used to describe a an animal dervived coagulant that includes the enzyme rennin or chymosin (the two terms refer to the same thing—-rennin is an older term while chymosin is the more chemically specific term for the same enzyme). 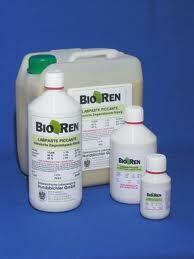 But rennet is only one of several types of coagulating agents. This the rennet used in most traditional cheese making plants. The rennet or rennin refers to collection of enzymes that comes from the fourth stomach of ruminant animals (kid, calf or lamb). If we look at rennet through a chemist’s eyes, rennet is chiefly made up of two enzymes that break down protein chains in milk: chymosin and pepsin. The enzyme mostly responsible for coagulating milk is chymosin as it works to breakdown casein—the primary protein of concern to cheesemakers. As chymosin is the chief coagulating agent, today we see highly clarified versions of animal rennets which contain up to 97% chymosin—an outcome considered to be desirable by some cheese makers hoping to achieve a very clean taste profile and quick set. In addition, there are now also organic animal rennets on the market. Animal rennet in any form is still the most expensive coagulant (Up to 2x more expensive than alternatives) on the market. It’s price is a function of supply which in turn is tied to events on the global market for cow, goat and lamb meat products. Some perceive the use of animal stomachs to produce rennet naturally as somewhat primitive. Others perceive it as an example of how to ensure we make use of all parts of an animal. Microbial rennet is term used to describe a coagulating agent produced by a specific type of mold, fungus or yeast organism grown and fermented in a lab setting. This coagulant is considered vegetarian friendly as the enzyme produced by the organism is not derived from an animal. While this type of rennet is appropriate for vegetarians, cheese makers agree that cheeses made with this type of microbial rennet tends to result in bitterness in the flavor profile especially when the cheese is aged. This coagulant is less expensive than animal rennet. But true microbial rennet is now hard to find. Its use has been replace d by FPC Rennet. This is fairly new type of microbial rennet (1990). This version of microbial rennet is made by taking the rennin producing gene out of the animal cell’s DNA string and then inserting into the a bacteria, yeast or mold host cell’s DNA string. Once inserted, the newly placed gene initiates the production of the chymosin enzyme within the host. The host culture is cultivated and fermented. The result. An inexpensive harvest of real chymosin enzymes. This is seen to be an improvement on the original microbial rennet as it is real chymosin and not a mold or yeast based substitute. Moreover, it can be more economically produced in unlimited supply and addresses some of the concerns with pure microbial rennet regarding the bitter flavor in aged cheeses. The procedure itself has been around for some time and is similar to the procedure used to make many vaccines. But, there is more to consider. FPC rennet is a GMO product. And, according to the culture companies, 90% of all cheeses produced in North America is made with FPC rennet. However, ingredient labels do not distinquish between this type of microbial rennet or the original non-GMO based type. And the fact that use of FPC type microbial rennet is not labeled a GMO product leaves those who oppose the use of GMOs in the dark when it comes to choosing their cheeses. In addition, further confusion and debate arises over the general differences between GMO products versus “genetically engineered” products as the latter elicits deeper concerns from those opposed to this type of science. While FPC rennet is GMO, it is not a genetically engineered product, technically speaking, because, the DNA taken from the animal cell and inserted into the DNA string of a bacterium or mold is not changed. Genetically engineered foods actually goes as far as to modify the specific gene responsible for a particular function in order to improve its function. In other words, it takes messing with genes to another, deeper level. Its like playing with the shape of the lego block its self, not just with the order of the lego blocks. In the end, what this means is that most cheese in North America is made from vegetarian friendly but still animal originated, GMO derived FPC rennet. And that while use of this type of rennet is banned in GMO-free European countries doesn’t mean the cheese we buy from those countries are necessarily FPC free. To quote one Danish expert “We can’t use FPC rennet in Denmark for our own domestic cheese or cheese make for other European countries which have banned its use. We only use it for cheese we export to North America. .”Why? Because again, it is a cheaper and more consistently available form of rennet. True vegetable (vrs vegetarian rennet term which is used interchangeably with microbial rennet) rennet comes from plants which produce certain enzymes that have coagulating properties. Some examples include cardoon thistle, fig tree bark or nettles. These are “real” vegetable rennets. However, they often also have undesirable effects on cheese flavor (bitterness) and are a little more unpredictable when used in cheeses not traditionally made with vegetable rennet. Still, some traditional Portuguese cheeses are still made with vegetable rennet as are cheeses in other countries where killing lets say, a calf, would not be allowed or economically wise. In North America, commercially produced vegetable rennet is hard if not impossible to source. However, some artisan cheese makers (e.g. in Maine) are experimenting with it once again and word has it that a company in Edmonton, Alberta will soon be commercially producing a true vegetable rennet. Finally, some cheeses like Ricotta are coagulated using simple lemon juice or vinegar. However, this coagulant is mostly used when making a heat precipitated curd. These coagulants are decidedly vegetarian. But this coagulant has a very limited use due to its limitations and noticeable taste profile. Traditional animal rennet is an enzyme derived from the stomachs of calves, lambs or goats before they consume anything but milk. (Ours is all from calves.) It is about 90% pure chymosin. Vegetable rennet is obtained from a type of mold (Mucur Miehei). However, even though it is derived from mold, there is no mold contained in the final product. It is an equivalent chymosin product which works equally well but is not animal derived. We have recently added organic vegetable rennet to our catalog. Rennet thrives at temperatures in the 85-105F range, but it won't be deactivated completely until it reaches the 140F's. Rennet continues working to set the milk as long as it has the right conditions. So, when a recipe calls for cutting the curds after a certain time period, it is important to follow the directions. Otherwise, your curds may be too firm for the cheese you are trying to make. 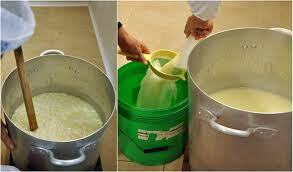 Rennet is standardized, so all the different kinds of rennet (liquid, tablet or powder) work the same to set milk. Liquid is the easiest to work with because you can measure it very precisely. However, the powders and tablets will keep better under more adverse conditions. Calf rennet is considered to be the best choice for longer aged cheeses because some of its residual components help to complete the breakdown of proteins. Some of the more complex proteins in the vegetable rennet can have a slightly bitter taste after 6 months of aging. The liquid vegetable rennet is Kosher, but it has been re-packaged without Kosher supervision. How much salt is in rennet? The amount of salt in rennet is miniscule. It is there as a preservative. 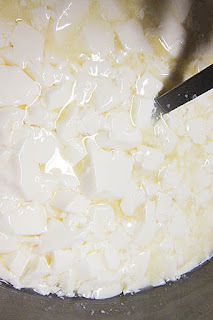 Considering that you add 1/4 teaspoon of rennet to a gallon of milk and that much of the rennet runs off with the whey during draining, the amount of salt left in the cheese is virtually impossible to measure. If you are interested in making cheese with no salt, the fresh cheeses, Mozzarella and Ricotta are best suited for this. The aged cheeses require a slight amount of salt to sow bacterial activity. 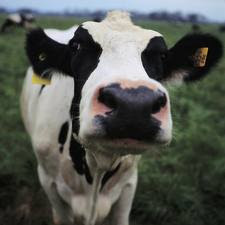 * This extract contains a number of enzymes which are designed to help these animals digest their mother's milk, and when added to milk, rennet will cause the milk to coagulate, forming the curds and whey which are so essential in the cheesemaking process. * Junket is a dessert which is made with sweetened, flavored milk, mixed with rennet to coagulate it. The coagulation causes the junket to set into a soft pudding, which is typically served chilled, often topped with fruit or spices. * Some cheesemakers continue to make and use rennet in this way; the vast majority use commercially processed rennet, which is made by creating a slurry and then subjecting it to a compound which will cause the enzymes to precipitate out. The main enzyme in rennet is rennin, although there are a few other enzymes as well, and the precise content depends on the animal the rennet comes from; sheep rennet, for example, is different from cow rennet. * Before the rennet can be added to a recipe, it must be dissolved in cool water; dissolution is critical for the rennet to work. 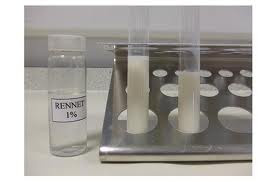 One important thing to know when working with rennet tablets is that high heat will deactivate the enzymes, which is why cool water is required for dissolution, and why temperature control of the milk used for cheese, junket, and other foods which call for rennet is very important. * Once curds have formed, cheese makers can cut the curds, drain them, and pack them into molds to make cheese. Several plants produce natural rennet compounds, as do some microbes, and these non-animal sources of rennet can be found for sale in stores which cater to vegetarians, and in shops which produce kosher dairy products. * Cheese is used in a dazzling array of culinary applications, with various types of cheeses being called for depending upon the desired effect. To make cheese, rennet, an enzyme complex produced in the stomach of all mammals, is introduced to milk. * Modern rennet is created through an extraction process which yields neat, dry tablets or a liquid which is very easy to work with. Traditional rennet was made by washing the stomach of a young ruminant after it has been slaughtered, and then salting it. * Over time, butchers started offering rennet as a useful byproduct of their business, and eventually companies seized upon the idea of making rennet in tablet and liquid form for convenience. A typical rennet tablet is white, and around the size of a thumbnail. Cheese Rennet is a preparation of the lining membrane of the true stomach of the calf, or a goat or sheep &c. which yields an enzyme capable of causing the coagulation of casein, and is used in the manufacture of some cheese. Traditional rennet was made by washing the stomach of a young ruminant after it has been slaughtered, and then salting it. The salted stomach is kept in dried form, with cooks snipping off small pieces and soaking them in water when they have a need for rennet. 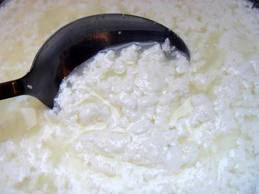 Some cheesemakers continue to make and use rennet in this way; the vast majority use commercially processed rennet, which is made by creating a slurry and then subjecting it to a compound which will cause the enzymes to precipitate out. The main enzyme in rennet is rennin, although there are a few other enzymes as well, and the precise content depends on the animal the rennet comes from; sheep rennet, for example, is different from cow rennet. When added to milk, the enzyme causes the milk to coagulate, essentially starting the digestion process. Once curds have formed, cheesemakers can cut the curds, drain them, and pack them into molds to make cheese.